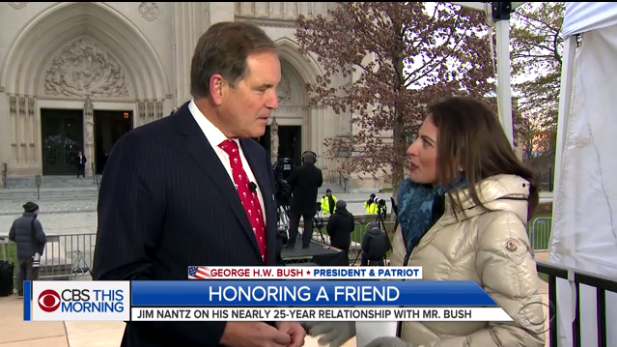 CBS Sports’ longtime lead play-by-play broadcaster Jim Nantz was a close friend of the late 41st president, and appeared on CBS This Morning to talk about that friendship. Nantz – who calls the NFL, the NCAA men’s basketball tournament, and the Masters on CBS – told CTM’s Bianna Golodryga that the two met on a Texas golf course in 1993, when he was starting out as a CBS Sports broadcaster and Bush had recently left the Oval Office. Nantz had been living in Houston, and Bush had just returned to Texas. “He did not want to be treated like anybody special. He’d walk in and put a credit card down at the public golf course and say, ‘I’ve got four golfers and two golf carts.’ And, ‘Oh, no, Mr. President, you’re our guest.’ ‘No,’ he says, ‘you don’t understand’ – this is how his mind would work – ‘if you comp me, I will never come back here because I’m going to think that if I call up the play that you think I’m expecting to be comped. You see, I don’t want anybody to think I’m looking for a free ride.’ So he wanted to pay. 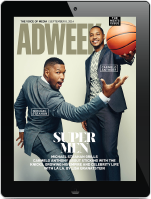 And he did,” Nantz remarked when asked what Bush’s pet peeve was. Nantz also talked about the unique friendship between Pres. Bush and Pres. Clinton, which he had a front row seat to. “One of the most beautiful things was to see two guys who had been political rivals, one of whom had defeated the other for the highest office in the land, and now that didn’t matter. This is a tribute to both of them, but there was a deep bond there. And that’s really a snapshot of who President Bush really was. He had friends that were Republicans, Democrats, he cared for all people,” Nantz said.